Book Review: The Cormorant by Chuck Wendig – AiPT! The final day of 2013 also brought us the release of the third book in Chuck Wendig’s Miriam Black series, The Cormorant. The first two books, Blackbirds and Mockingbird, were exhilarating works of urban fantasy. 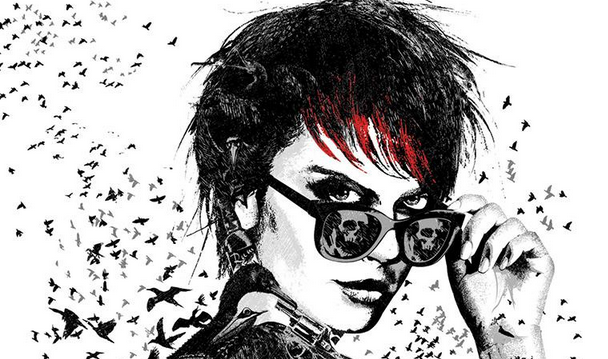 Not only did they give us in Miriam Black one of the best new characters in modern fiction, but the world building, dialogue, and suspense were also all top notch. The ending of Mockingbird promised to put Miriam in even more strange and dangerous situations. So is it good? Well once again, I’m happy to report that the latest entry in Miriam’s journey makes for some truly excellent reading. It’s so good, in fact, that The Cormorant is arguably the best book in the series to date. After heading out on her own, Miriam is busy rediscovering that a life without structure can be just as bad as it was in her previously restrictive environment. But a bizarre job offer from the strangest state in America (Florida, obviously) ends up leading her into a deadly game of cat and mouse. Not only is someone hunting her, but they also appear have a power of their own that rivals Miriam’s… and absolutely no qualms about hurting as many people as possible to get to her. Although The Coromorant doesn’t quite start off with the “bang” that Mockingbird did, Wendig excellently utilizes a non-linear story structure that keeps you on the edge of your seat from the first page. It’s a device that can easily cause things to go off the rails, but that never happens here. The interludes and flashbacks are always clear and purposeful, giving us just enough information and intrigue before diving right back into the meat of the plot. The plot, by the way, is fantastic. Aspects from Miriam’s past are woven together with things that have only been mentioned or remembered (like Miriam’s mother) along with more than enough new pieces to make it feel fresh. You’d think that it would be hard to put Miriam into even greater danger that what she’s already faced, but Wendig manages to do just that. Much like the previous books in the series, the final pages of The Coromorant were exhilarating. This time, however, it was at an entirely new level. I usually laugh at people who say that reading something in a book made them jump. I mean, seriously…you read it; it’s not like it popped out at you or something. But for the first time ever, I can truly say that a scene in one of the last few chapters made my heart skip a beat. The ending itself was also incredibly powerful, sticking with me due to exhilaration as much as the good dose of heartache that it provided. Unlike in Mockingbird, Wendig calls on more than one character from the previous books. Fortunately, it never feels recycled or derivative. In fact, there were a couple I’d forgotten about who were a lot of fun to spend some more time with. The new characters are just that: new. They have their own distinct voices and personalities. By the end of the book, you’ll have just as strong opinions about them as Miriam does. As far as Miriam herself goes, she is at her usual darkly valiant best. She provides all laugh out loud moments, angry introspection, and gritty badassery that we’ve come to expect from her. But finally getting to see Miriam interact with her mother is where the really good stuff happens. Their meetings/confrontations could have easily been contrived or predictable, but instead give us new and surprising insights into both characters that make them even more compelling. The villain this time around is also completely different from the previous dark forces that Miriam has faced. Her adversary is not only more determined, but supernaturally capable of hurting Miriam in ways that makes this antagonist truly feel unstoppable. Wendig’s ability to build and convey the world around Miriam is at the top of its game, right down to the most mundane details. For example: I have never smoked a cigarette in my life. But Wendig’s description of Miriam’s physical and mental reactions to taking the first puff off a freshly lit cancer stick were so rich that I almost wanted one myself. I’ll admit I was initially worried about the story being set in the Florida Keys instead of a more traditionally urban environment. But Wendig describes the area perfectly, making that weird place (that I would like to revisit myself one day) feel like the only location in which such a bizarre tale could take place. The supernatural elements are also treated with the same usual care. Seeds from the previous novels continue to be cultivated while new ones are carefully sowed. It all leads to a well-paced expansion of the universe’s mythology without ever feeling like the story has broken away from his reality-based roots. Umm…not much. There were a couple times I felt that Wendig got a little too cute with the short chapters, including a long stretch of travel I would have liked to have seen. But in all honesty, Miriam’s drive down the east coast to the state of Florida would not have done much to service the story’s plot…although you just know she had to have gotten into it with a drunk person at a gas station/Waffle House along the way. Otherwise, my only other “complaint” was that I couldn’t put the book down to get anything else done. It keeps you reading from start to finish. The contents of The Coromorant, along with the other Miriam Black novels, would be great no matter what the cover looked like. It wouldn’t have changed them one bit if Wendig had used a picture of an unflushed turd (which actually would have been pretty ballsy). But the covers for the Miriam Black series by Joey Hi-Fi have been gorgeous. The artwork for The Cormorant, however, is easily his best one yet. The story details within the figure of Miriam, along with the look on her eyes as she lowers her shades, are as beautiful are they are unsettling. I know this isn’t an art review, but the cover to this one is so good that at least a little praise needed to be shared. Non-linear story structure will keep you on the edge of your seat from start to finish. Miriam Black is her usual awesome self, but interacting with some key characters from her past also exposes us to a new side of her. The world building, location, and supernatural elements area all treated with such care that they become great characters in and of themselves. This book won’t let you put it down. Chuck Wendig and Miriam Black are at the top of their games with this one. You really can’t ask for a more entertaining and affecting work of supernatural fiction…or any type of fiction, for that matter. If you love great stories and even greater characters, than you need to be reading the Miriam Black series. If you are already reading it, than the next book cannot come out soon enough. You can buy The Cormorant from Amazon , Barnes and Noble, and Indie Bound. You can also purchase a DRM-Free EBook from the publisher, Angry Robot Books.